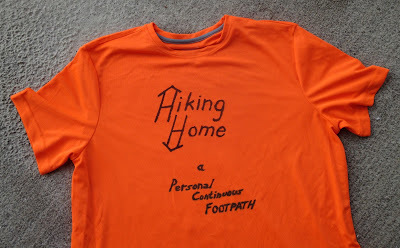 I have chosen to hike the North Country Trail because it is the only footpath that can get me from the east coast to my childhood home in south central Wisconsin, the next destination in my journey to connect every place I've ever lived. 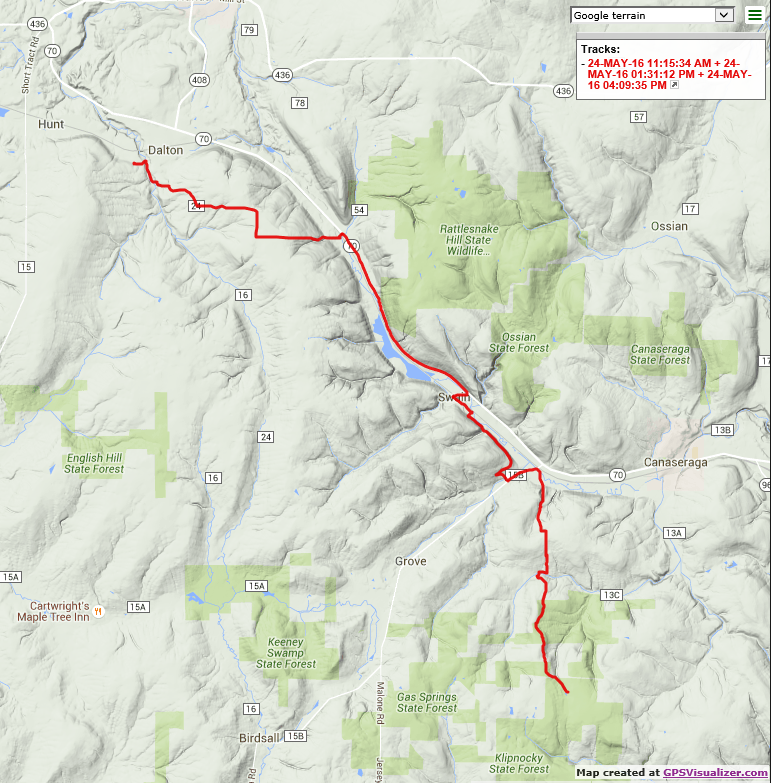 The American Discovery Trail is another alternative, and the ADT is the only trail that will get me from Wisconsin to Colorado - the last home I will connect to - but it is not a trail that strives to become a foot-travel-only path. 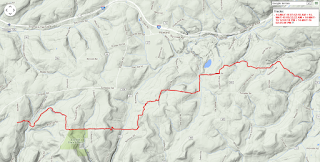 It uses a lot of long rail trails to get across the country, and a whole lot of plain old auto roads. 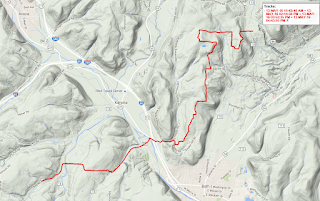 The ADT has no federal designation yet because it doesn't qualify as a National Scenic Trail. 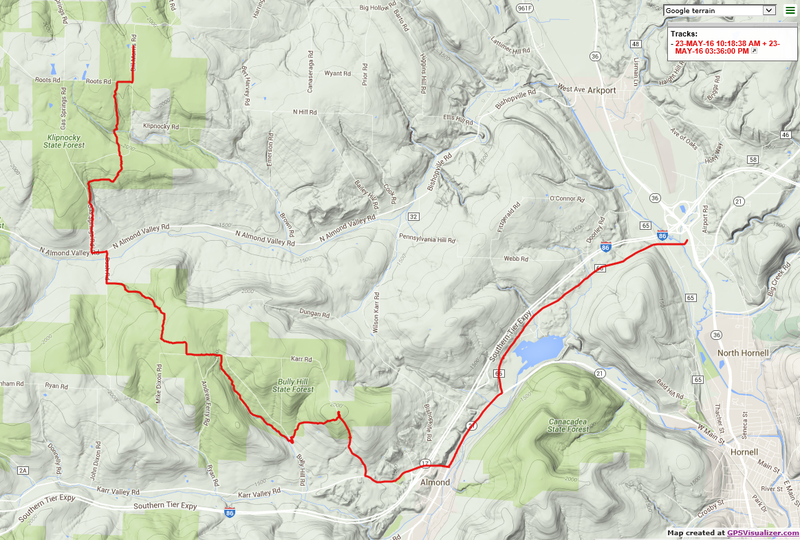 The North Country Trail is a National Scenic Trail. And that's why I'm planning to hike all of it except the eastern and western ends. Here are my first impressions. It's a low key trail. It doesn't seem to have much of a central organization, though it has a fancy headquarters building right near the trail in downtown Lowell, Michigan. 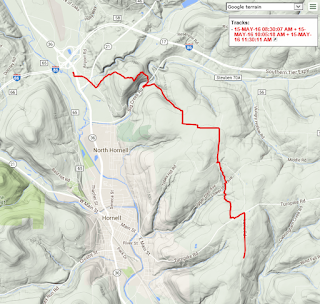 It doesn't even sell maps for the parts of the trail in New York and Ohio, but defers to the local organizations of the older Finger Lakes Trail and Buckeye Trail, which it follows for long distances. Here in lightly populated western New York the footpath has a mix of public land, private woodland, and road walks. Very few people hike it. Here, for example, is a shelter with a great view, but notice the grass around it entirely untouched by human feet for at least a couple weeks. 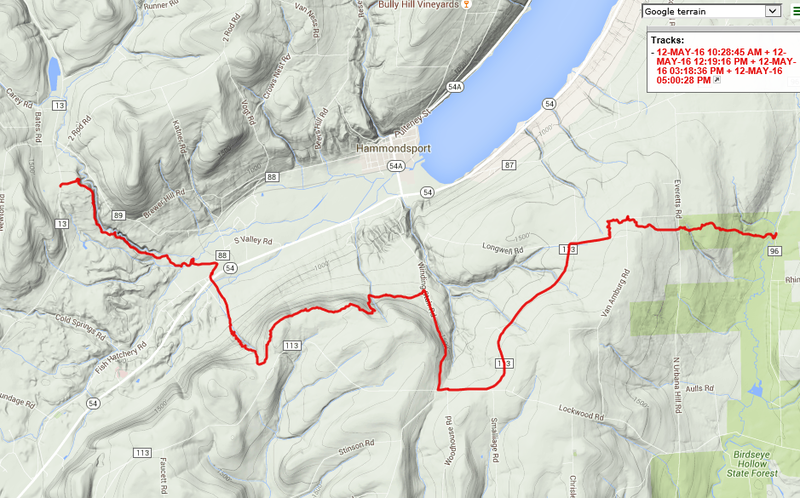 I know nobody's been out hiking because the Finger Lakes Trail people seem obsessed with Trail Registers. They have one every four or five miles on average. And the number of entries in these registers is limited to a couple dozen per year. 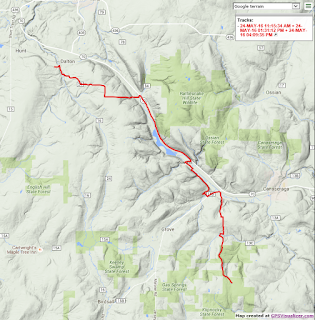 But the North Country Trail is a very long trail - 4600 miles from western North Dakota to Eastern New York via the Kentucky border in southern Ohio. It would be unfair to pass judgment on such a vast trail after having only hiked a piece of it for a week across western New York. So here, without further analysis, are the highlights of a week on the North Country Trail. I've passed a wind farm near Howard, NY, with the gargantuan windmills making swooshing sounds that can be heard from a mile away. It is still early spring here, and I passed a woods where the ground was carpeted with 'Trilliums by the Milliums'. 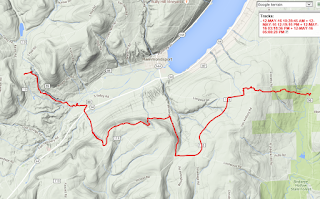 I hiked past a spectacular view of Keuka Lake, one of the major Finger Lakes, yet it was obscured by trees. This was the best view from the trail. The only clear view I got was from much lower down and far from the trail. I've hiked a few 'gorges' or gullies, with steep sided walls and breathtaking cascading streams. My favorite was the one near Garwoods, NY, where the trail was the stream bed and the flow was low enough to walk it without getting wet. There aren't many tree plantations in this area, but I hiked this one on a day when the temperature remained in the 30's and there were intermittent snow flurries all day. But on another day the temperature was in the mid 80's, and that brought the wild azaleas into bloom. Here's one that is perched on the brink of a slide area with a view of the Genesee River. Now here's the key. At least once on each of the seven days on the NCT I've had at least one moment of pure joy - the feeling that I would not want to be anywhere but here, and that I am abundantly blessed to be able to have this experience. It is for these moments that I hike. 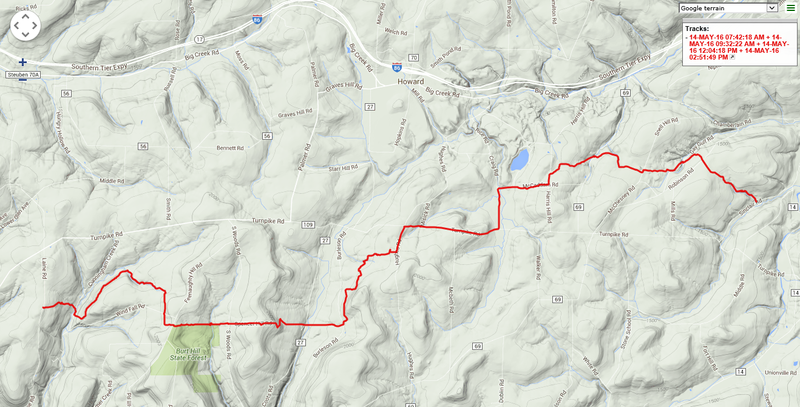 For those interested in details of my route, I present the seven maps of my daily route below. Great photos PJ and you hit the nail on the head when you said not many folks out there hiking the NCT/FLT. You captured some of its allure here. Those moments you talk about of sheer happiness - made me smile. That tells you that you are indeed doing that which you should be doing. Keep on trekkin'and keep the posts coming!